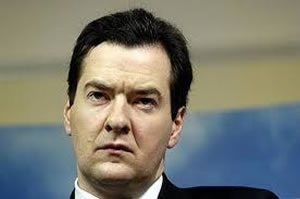 Osborne has gutted the UK economy, making it increasingly difficult to reduce the deficit, reports Ben Fox. The government continues to put on a brave face but they won’t have welcomed the news that the Organisation for Economic Co-operation (OECD) has become the latest body to downgrade the UK’s growth prospects. What may have surprised them is the scale of Britain’s economic weakness. The OECD predicts that the UK economy will grow by 0.1% between July and September and by less than 0.1% in the final quarter. If the think-tank is right it will mean growth of under 0.9% for 2011. Indeed, as a result, as Cormac Hollinsgworth has shown on Left Foot Forward, if the prediction is accurate then Osborne will be unable to cut the deficit at all. At present economic stagnation is not just a British disease. The OECD’s economic forecasts have also cast more gloom over the collapsing recovery in the euro area. For example, it believes that the German economy may well contract in the final quarter of 2011. Hit by a collapsing demand for its exports and market fears about the future of the eurozone, Germany’s latest wirtschaftwunder, expected by many to drive growth in Europe, has not lasted very long. “The western powers are almost all looking decidedly sickly. But Britain is emphatically looking like one of the runts of the litter”. Within the EU only debt-ridden Greece and the increasingly fragile looking Italy are expected to have a weaker economic performance than the UK in 2011. Unsurprisingly, Chancellor George Osborne continues to refuse to admit that his austerity plans have choked off recovery, yet again blaming a combination of increasing oil prices, the Eurozone crisis and the problems facing the US economy. Somewhat perversely, the OECD’s chief economist, Pier Carlo Padoan, said that the Coalition should not change its austerity plans on the grounds that “the (deficit) effort has been very, very important”, but at the same time indicated that it was only a matter of time before the Bank of England should engage in further quantitative easing. Meanwhile, in Frankfurt the European Central Bank (ECB) followed the lead of the OECD in cutting its growth forecast for the Eurozone to 1.6% for 2011 and 1.3% for 2012. The ECB, which has otherwise been the best performer during the financial crisis, is coming under increasing pressure to reverse its interest rate increases in April and July. The ECB’s cerebral President Jean Claude Trichet is known for being an inflation hawk but it is clear that economic stagnation in the Eurozone is a greater risk than an inflation hike. While the risk of contagion from Greece and speculative attack on Spanish and Italian bond yields remains, the Eurozone needs to cut interest rates from 1.5% back to 1% or lower to encourage growth. But while Osborne refuses to change tack, President Obama’s proposed Jobs Act is proof that an alternative to austerity exists. The $450bn bill involves a combination of straightforward stimulus measures in the form of extra transport and infrastructure spending alongside tax cuts for workers and tax cuts and incentives for businesses to take on new employees. In the absence of any similar plan by the coalition to ‘go for growth’ the economic flat-lining that started in quarter four of 2010 seems certain to continue well into 2012, and with inflation still running at over 4% most Britons will continue to feel the economic pinch. But so will the government. The chancellor’s ambitious deficit and debt reduction targets were based on economic growth at least twice as strong. Indeed, when the Office of Budgetary Responsibility (OBR) confidently predicted growth of 1.7% back in March this was still a downgrade on the (2.3%) predicted by the Treasury in last year’s emergency budget. A stagnant economy with weak tax receipts will blow what’s left of Osborne’s fiscal plans out of the water. UK Conservative austerity CUTS choke off recovery! http://t.co/soYMdjQ #wiunion #weareohio Conservatives ALWAYS make things worse!